I am setting up another C8 for my parents for Christmas and noticed that not only was Accuweather on Tuesday still (today is Wed) but the Woot widget showed the wrong stuff too. However other widgets seem current (like NOAA) I had to reboot (w/ power button, not pull power) to get it to show the currecnt stuff/data. Here is how their unit it set up. It wakes up at 5am (CST) with a channel called "WakUp" then at 8am it goes to a channel called "Main Channel" then at 11pm it goes into Dark Mode. So in theory the unit should have pulled fresh info for "WakeUp" when it lanuched this morning @ 5am after being in dark mode. (note: the channel it was playing before Dark Mode was "Main Channel" that was invoked at 8am the prevoius day). Could this be the issue, that the unit is not pulling the current channel from the Chumby server? I would guess not, it's almost like even though the clock is right on the unit, it has the wrong date to work from (as far as current data for channels) but then other channels seem to work? Strange. I assume perhaps a problem with the code in the widget then, but I think it works on my C1 and ole school Chumby, but I need to verify that first. So in any event, today it seemed to be fixed by powering the unit off and then back on again. I think the biggest challange is that this "bug" is not easy to troubleshoot since it seems some days it's not there. Caveat: I know I have seen traffic about this, but searched and could not find much or what character string would fetch them, hence the this new post. I got my Chumby 8 about 2 weeks ago and noticed that my AccuWeather widget is not updating unless I reset my Chumby. Funny thing is, I still have my original Chumby in another location in the house and the AccuWeather widget updates fine on that. yea, my ole school Chumby (the squishy one that has leather around it) seems fine. I guess it's more of a platform issue then an app since AccuWeather seems to work fine on our OC (orginal chumby). Thanks for the reply to let me know it not just me. It's not the channel - apparently there's some issue with HTTP caching on the C8. I'm looking into it. I've spent the past few hours here at Chumby running a channel that consists of woot, noaa weather, and accuweather -- no other widgets, and with the default widget cycle times. I've got some debug output displaying to watch what is happening in the cache, and it seems to me that both accuweather and woot are performing properly (cache is being expired, and data is keeping up with the same widgets being displayed on the chumby website where I have the same channel running). NOAA widget has its own caching logic, such that it should update every 3 hours, BTW. The accuweather widget updates are more along the lines of 4 to 5 minutes. I know that that at least one person has reported the problem as hard to duplicate, so that may be the reason I am not seeing this. In the interest of eliminating (the Chumby) HTTP Cache as the culprit, would someone who is comfortable with Unix command line and able to duplicate the problem mind doing the following? -- In the control panel, visit Settings (the gear icon) -> "Device Info" -> pi menu, and click on SSHD to enable SSH into the device (unless you already have SSH enabled for the device). Save the changes, then restart the chumby. The above entry disables our cache completely, so if the cache logic is the problem, this setting likely will fix it. And if you try this, please let me know if the problem persists, or goes away. And I'll continue to try and duplicate the problem. Any further hints or suggestions would be appreciated. I will try this and get back to you. It may be a 24hr deal or something becase this morning the accuweather one read fine but it was at 5:30 am and I rebooted it at 8:00am the day prior. Let me see what happends the next day or two and then over the weekend I will disable the http cache and see if it continues. Sounds great. I'll be doing effectively the same here with cache enabled on a couple of chumbys (one of which is configured with alarms), while I study the cache implementation in more detail. My personal unit (not the one I am setting up and testing for my parents and casued me to post this thread) was rebooted three days ago and is showing this. Once again Accuweather was not current but NOAA seemed to be. I have it set to go from Dark Mode at 5:30am to a channel called Wake Up (note: before invoking Dark Mode at 11PM it was playing a channel called Defualt). Anyway, I changed the time on the alarm (event) to 5:15 (since I am getting up tad ealier now) and when I launched the Wake Up channel then Acuweather was correct. I want to say before I had to cycle power to make it current. Perhaps something in the alarm config changing clears something like when I reboot (via the power button, not pulling power); then it could have also been chance? I will be chaning the cache on one tonight and then rebooting both at the same time for a control and variable er se. For what it is worth, my original chumby is still updating my Accuweather fine. My C8 however is still showing weather from 2 days ago. It will stay that way till I reboot. This sounds like the problem as originally stated. Feel free to disable cache on that device as noted previously, and see if you can reproduce. Both my systems (both with default cache settings, e.g., enabled) are updating fine so far (one of them after going thru the alarm states), so I have yet to reproduce. It suggests cache is not the problem, which makes it important to try and duplicate with cache disabled. Thanks for your help. I know it's asking alot to do the above, and I apologize you are seeing problems to begin with, but without a reproducible case and data, we are going to have a hard time isolating and fixing the problem. I am trying to edit the flashplayer.cfg file, but when I SSH into my chumby 8, there is no flashplayer.cfg. Am I doing something wrong? So I created a text file in my PC called flashplayer.cfg. Added the lines to that file and saved it to my thumbdrive. I then copied the file to the PSP directory. Is that what I needed to? Yes - by default there is no flashplayer.cfg. This file is used to override the built-in default configuration settings. However, the text file must use UNIX-style line endings (ie linefeed, not carriage return). My Accuweather is now updating. I disabled the cache in the flashplayer.cfg file and it is updating perfectly now. Was this after a reboot, casue it can work fine for a couple days after that. Mine worked until this morning from Friday. I am going to edit one today. I rebooted after I set the cache to 0. Since then it has been updating. Hardest part in any bug fixing is often just trying to get a reproducible test case. I've had two chumby's running my 3 app channel (accuweather, woot, and noaa). So far, I'm not seeing any problems, other than a sudden desire to buy stuff on woot :-). And restart your chumby and wait for the problem to surface again. If it does, please e-mail me the cachestats.txt and log.txt files. These may help me see what the problem is. The LogFile line will generate a log file that may show errors in the cache code. The cachestats file will be a dump of the cache, showing me its current state. One thing I'd like to do here is try to recreate your setup exactly (channel content, and any other settings), in the hopes that I can trigger the bug. Ideally, you are running a default channel on the chumby, maybe with a few tweeks, and I can duplicate the setup here (basically, I'd be looking for what apps you are running, in what order, and the intervals involved). woot (default time), noaa weather (default time), accuweather (30 seconds)? This will ratchet up the error reporting level for the cache code, which is what we want. I tried putting those commands in my flashplayer.cfg and rebooting (did it twice). Both times it gets stuck in a loop booting up. It checks the browser, network, etc. I see the settings screen for about 1 second, then it reboots and goes back to authorizing, checking date, browser, initialize control panel, back to my settings screen for 1 sec, then reboots again. EDIT: This morning I did notice that Accuweather had not updated since 9:35Pm last night. Also, the Facebook widget had also not updated...the status updates were 7 hours old. One other thing, I tried adding the NOAA widget, but every time it opened, it would forget my zip code and I had to keep reentering it. I apologize! That HTTPMallocOpts setting is not behaving well at all (I get the same results here as you reported, guess it is buggy). So, with that removed, you were able to duplicate? If so, I would be interested in seeing the log.txt and cachestats.txt. Then I inserted a line and typed "HHTPCacheSize 0" and the quit. Did I need to put "LF" after it? I assume not since I used Vi verses maing it in winword/notepad and then cut and pasting it. how can I check to see if I did it correctly? Thanks and sorry to be daft, I have just enough linux knowlege to be dangerous. I think if you added the lines related to log files, and are getting the log files generated, you did it right. I will remove that line and try it again tonight when I get home. So the C8 that I created the file on and added the line of code is working just fine and the other C8 is showing weather on Accuweather from 1:45pm and it's 8:52pm right now. So I guess I did do it correctly and we are on to something, of which the latter we already knew.. Thanks Syd (you too Duane)! Hi everyone - thanks for the informative thread. 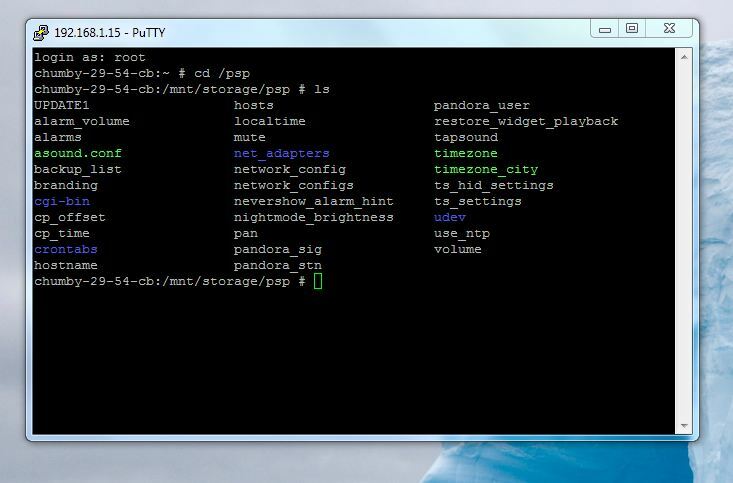 I just use putty, ssh'd to the Chumby 8, created the flashplayer.cfg file and inserted just one line HTTPCacheSize 0 with an enter key to force the proper end of line I hope. For there record I was finding NOAA, Accuweather, Wiki of the day, and several Google News feeds were not updating. I will continue to follow your thread and post my results. Please let me know if there is anything I can do to assist.